I have finally discovered a country where it rains more than in the UK! My experiences during a recent holiday to Costa Rica have underlined the notion that, given the appropriate climatic conditions, the flora and fauna most suited will flourish. The rainforest conditions so prevalent throughout this small country clearly favour dramatic growth and diversity of plants and animals. It should therefore come as no surprise that an environment that is so damp should be home to so many different amphibians and their predators. 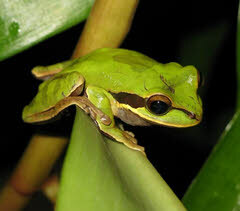 Exotic species like these are rarely kept as "pets" in this country and, given the highly toxic nature of some of these amphibians, I am not disappointed! The "hazardous effects" of our own domesticated species appear rather tame in comparison. The concept of an appropriate environment is still an important one and is probably the most common reason why exotic species fail to thrive and succumb to disease when kept as pets in the UK. Whilst internet access has improved the widespread availability of information enormously, inadequate research into the basic husbandry and feeding requirements of these exotics species remains the biggest hurdle in combating disease.